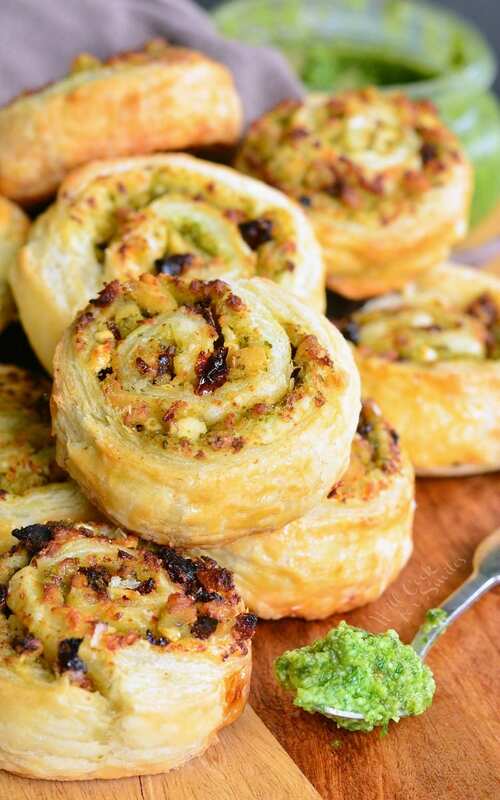 Flaky pastry, juicy chicken, fresh pesto, sun dried tomatoes, and feta cheese; many tasty ingredients are rolled together into delightful pinwheels. 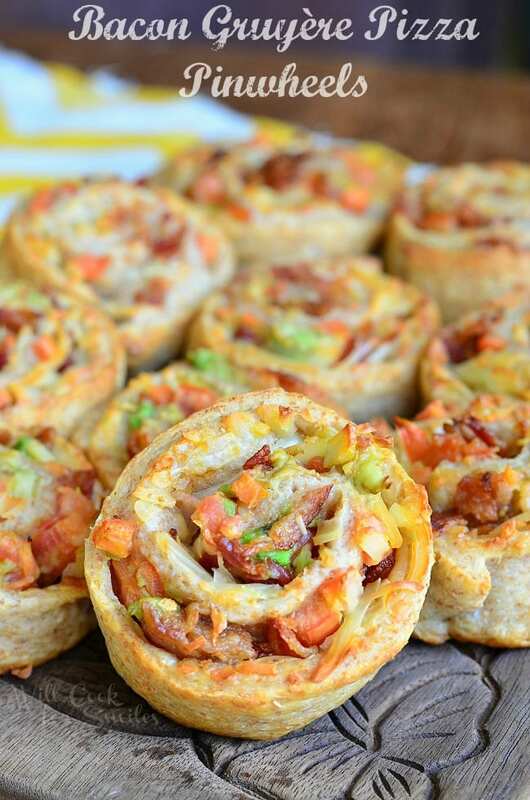 These pinwheels would be a perfect finger food for holidays, parties, or simply as an after-school snack. I feel so odd when the holidays are over. Months and months of preparation, excitement, and anticipation all come to an end over two days. It’s a little sad when Christmas is over and even the Christmas tree looks sad and lonely without the presents underneath. But, there is one more blow out left to look forward to this year. Some say it might be the biggest blow out of the year. It’s New Year’s Eve! Whether you’re trying to find the biggest, craziest party with the best view of the fireworks, or you will be cozy at home with a few close friends and sparklers, New Year’s Eve will be an all night celebration. I remember trying to decide on the best party to go to and being out until 8 in the morning. But now, after you have kids, it’s staying home with sparkler’s and watching the ball drop on TV. It’s not so bad thought because I don’t have to share champagne and delicious food with lot’s of people. It doesn’t really matter to me if it’s just my husband and I greeting the New Year, or we have a few friends over, I always prepare a party table. My grandma and I always cooked for a crowd for New Year’s Eve, even when it was only supposed to be only a couple of people. We decorated the table, prepared too much food, got dressed up, and had lot’s of champagne and sparklers ready. We went big even when it was just us. Because of that, the tradition of New Year’s Eve being a big deal no matter where I am or who I’m with is embedded deep within me. 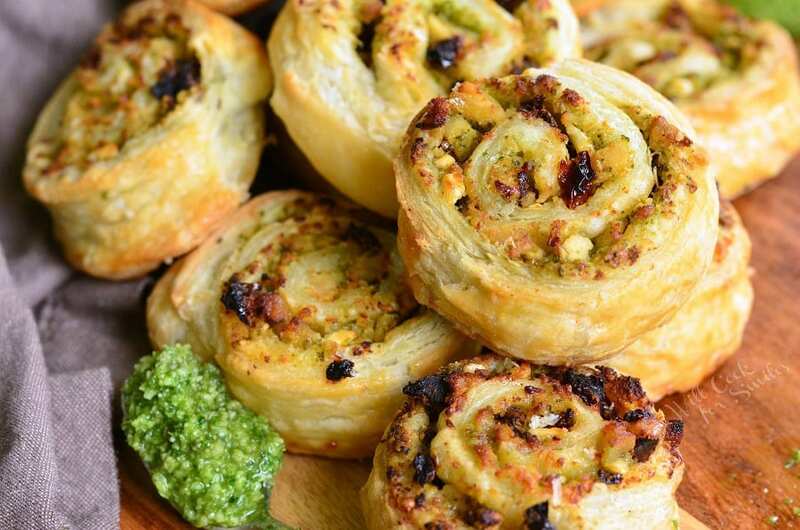 For New Year’s Eve party, I like to make easy finger foods and very often pizza pinwheels. Pinwheels are always a hit no matter what party I bring them to and no matter what the filling is. 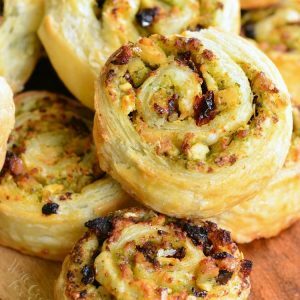 It might be a simple ham and cheese, a classic pepperoni and cheese, or a delicious Pesto Chicken Pinwheels, people love them! It’s impossible not to love flaky, warm pastry with delicious, filling inside. 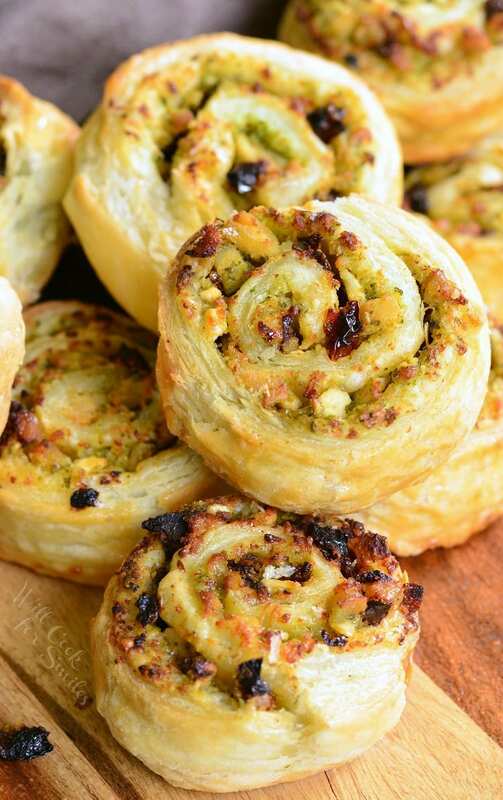 Flaky pastry, juicy chicken, fresh pesto, sun dried tomatoes, and feta cheese; many tasty ingredients are rolled together into delightful pinwheels. Thaw puff pastry on top of parchment paper. Season chicken breasts with some salt and pepper and cook over medium heat. Once chicken is cooked, take out and let it cool until it can be handled. Once it's cooled enough, dice the chicken and place it into a mixing bowl. Preheat oven to 400 and line a large baking sheet with parchment paper. Add feta cheese, minced sun dried tomatoes, salt, olive oil, and pesto to the mixing bowl as well. Mix until all evenly incorporated. 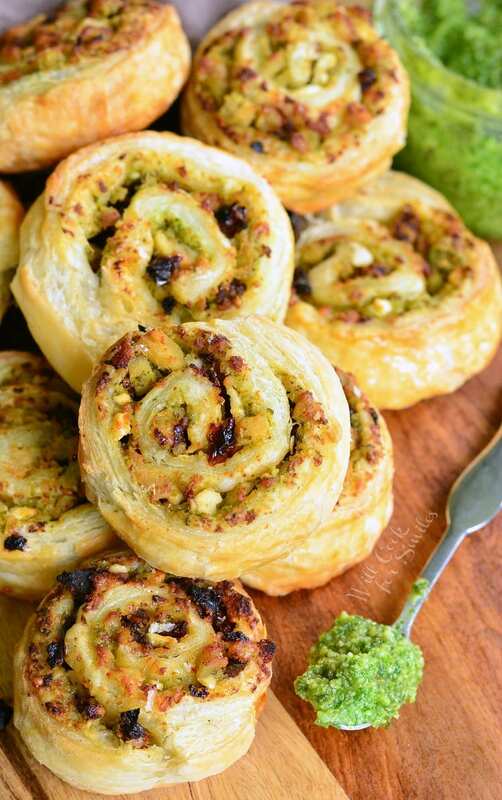 Spread about 2 tablespoons of pesto over each pastry sheet, covering it almost completely. Leave about an inch on one edge without pesto, that will be the edge to seal the roll. Divide chicken mixture among the two pastry sheets and spread the mixture evenly over the top of the pastry, again, leaving that one inch uncovered. Roll the pastry with the mixture towards that uncovered edge and stop just before. Whisk egg white and brush the uncovered pastry edge with egg white. Roll the pastry to the end and gently press to seal. Place each roll seam down. Brush tops of the rolls with egg white. Cut across each roll with a serrated knife to create pinwheels that are about an inch thick. Place the pinwheels on the prepared parchment paper about 2 inches apart. Bake for 15-17 minutes, until golden brown. 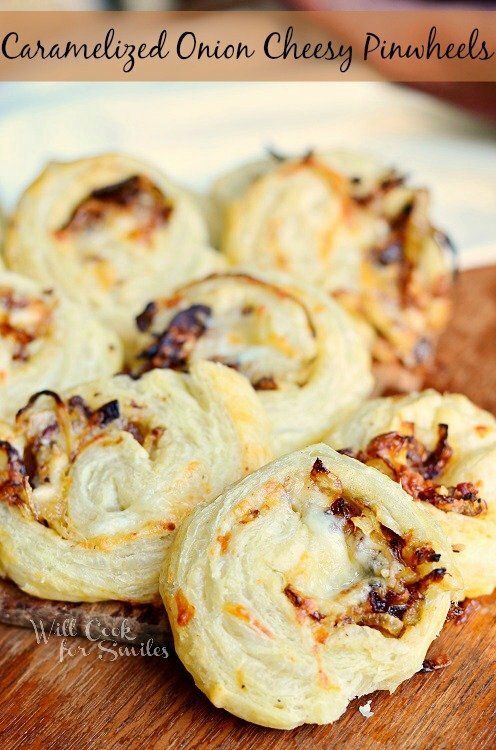 After these pinwheels are baked and then cooled, can they be frozen? If so, how long will they keep in the freezer? Thank you very much in advance for your time and effort. 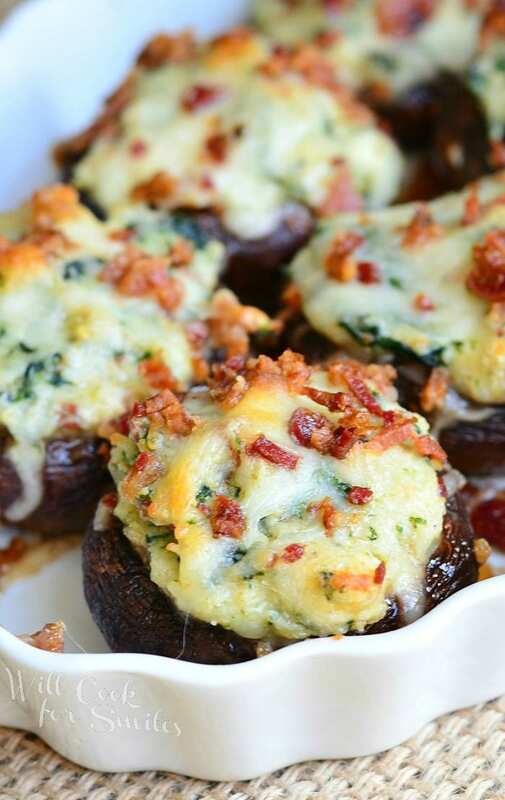 This type of filling is perfect for this dish. As a result, we get a pretty good taste. I think that your guests will surely enjoy this treat.